Yikes. What a royal mess our beloved Prime Minister is in. I could well understand if there were cries of "Off with his head!!!" to be heard from the palace. Diplomatic disaster. That's PM 5265617 in a nutshell. The Place is rightfully furious with Abbott, Government House has icicles hanging off it when Abbott looks in that direction and the #knightsanddames is an absolute fiasco from start to finish with nobody now knowing if Quentin Bryce really is a Dame or if Peter Cosgrove really has been knighted. According to my sources, when the Prime Minister Tony Abbott grandly announced he was restoring knights and dames on 25 March, nothing was set in stone. In short, he lied about the Letters Patent. And there is no such thing as an “electronic" Letters Patent — like the honours themselves, the “Letters” are a relic of another day and age. Abbott has second guessed the Queen, which would be, in the eyes of the Palace, simply unforgiveable. One does not do that to Betty. Abbott did. The damage he has wrought is significant. Oh dear... Tony, Tony, Tony!! & then you go off to Japan & snub her son , daughter & grandchild, what were you thinking!! They're over in NZ at the moment right? 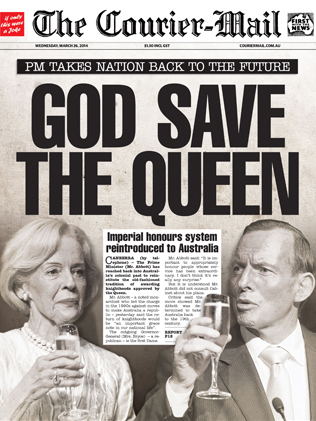 Though I'm surprised that, as an prominent monarchist, Abbott would have missed this.